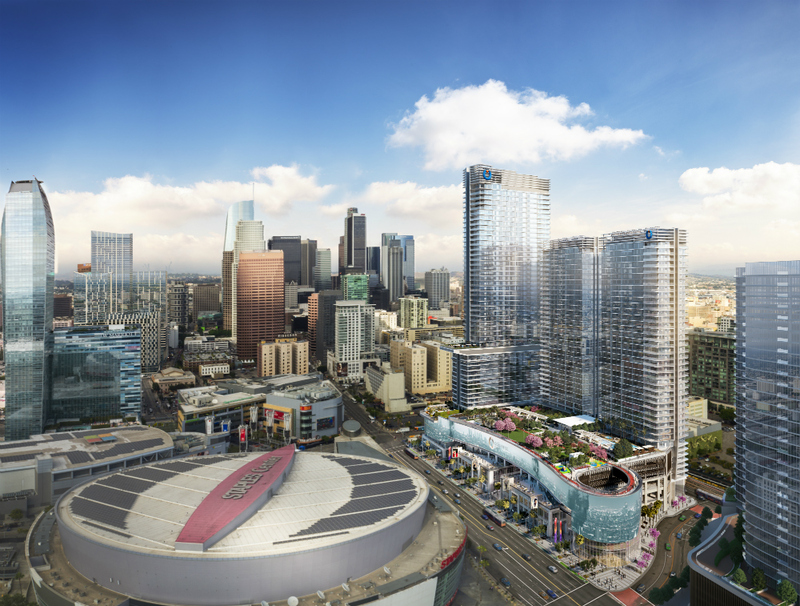 Global architecture firm Callison RTKL and Newport Beach, California–based MJS Landscape Architecture have released a rendering of a new 66-story tall mixed-use residential tower proposed for the bustling entertainment district in Downtown Los Angeles. According to documents submitted to the Los Angeles Planning Department, the project would bring 200 condominium units and a 220-room hotel to 925 S. Figueroa, Urbanize.LA reports. The project would also include 94,000 square feet of retail spaces and parking for 617 automobiles. 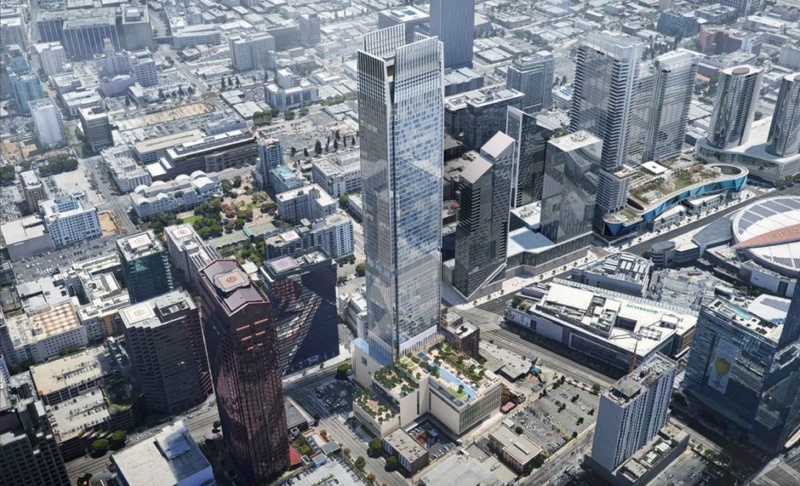 The project is one of a handful of towers Callison RTKL is currently working on in the Downtown L.A. area, including a 57-story tall, Jenga-shaped tower proposed for a lot adjacent to Pershing Square. That tower features projecting, cantilevered swimming pools and a sky-lobby. Callison RTKL is also working on the three-towered Oceanwide Plaza, also on Figueroa Street. The new, rectangular tower is set to rise out of a large parking and retail podium. 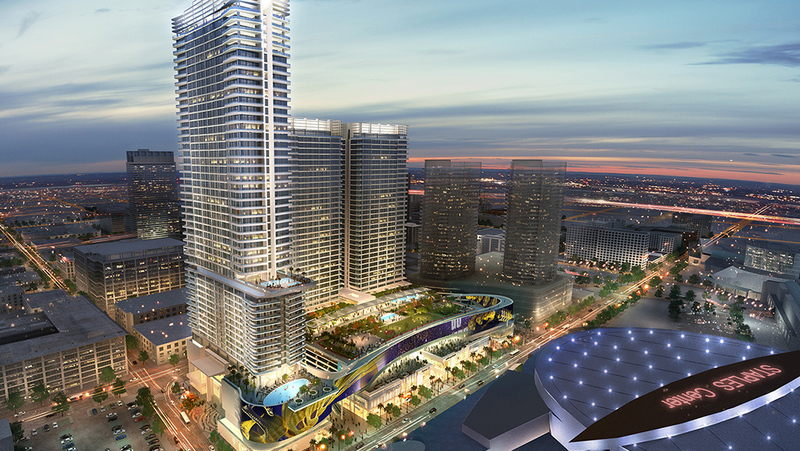 That podium will be topped with recreational uses for hotel guests and condominium residents. The rendering released for the project indicates that like many of the historic high-rise towers across downtown, the monolith will be capped by a flat-topped roof. 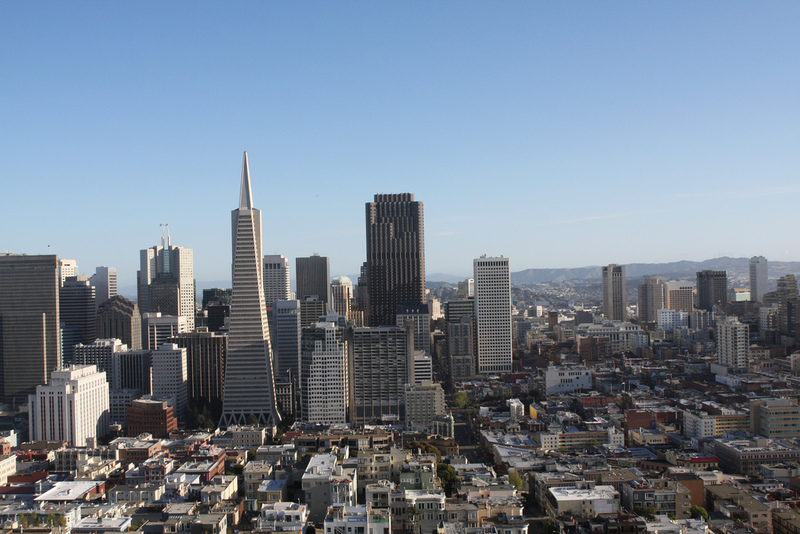 The arrangement used to be inscribed in local fire code as a safety measure to be utilized in the event tall buildings had to be evacuated via helicopter, but the rule was recently overturned. The project at 925 S. Figueroa marks the 19th high-rise tower proposed or under construction along Figueroa Street in Downtown Los Angeles. Architects Gensler recently revealed plans for an eccentric, 52-story tall tower at the southern edge of this new district. 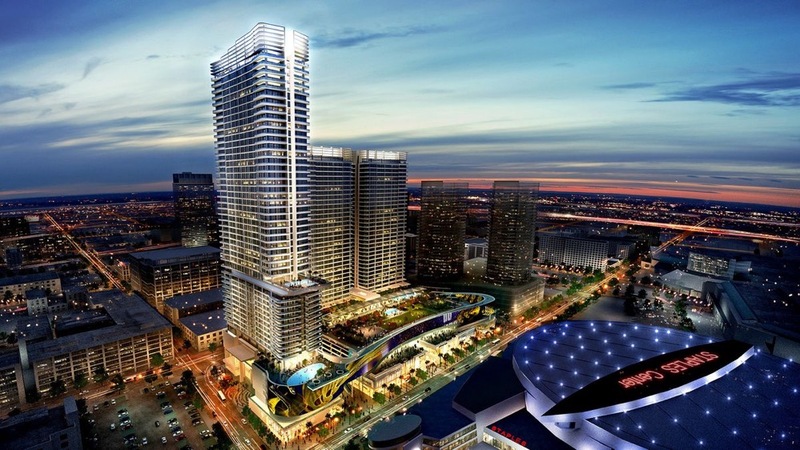 Gensler is also responsible for the Metropolis, 1020 South Figueroa, and Fig+Pico projects along Figueroa. Meanwhile, SOM and P-A-T-T-E-R-N-S are behind the Olympia development, while Harley Ellis Devereaux and Hanson LA are deep into construction on the twin Circa towers. The developments—which track along the Blue and Expo light rail lines and surround the L.A. Live, Staples Center, and Los Angeles Convention Center complexes—are sure to continue to grow in their ranks as the city moves toward building 8,000 new hotel rooms near the Convention Center by 2020. Luxury hotelier Park Hyatt announced this week that it has signed up to be a part of Oceanwide Plaza, $1 billion, 1,488,101-square foot, mixed-use development in Downtown Los Angeles. The development would mark the brand's first Los Angeles location. It is unclear whether the Park Hyatt addition will change the project’s fundamental details, but previously-filed plans for Oceanwide Plaza detail the inclusion of 504 condominium units, 153,000-square feet of retail space, and a hotel with 183 guest rooms. The project is being designed by CallisonRTKL and will be contained within a trio of high-rise towers positioned above a mid-rise retail podium outfitted as an indoor-outdoor “galleria”-style mall. 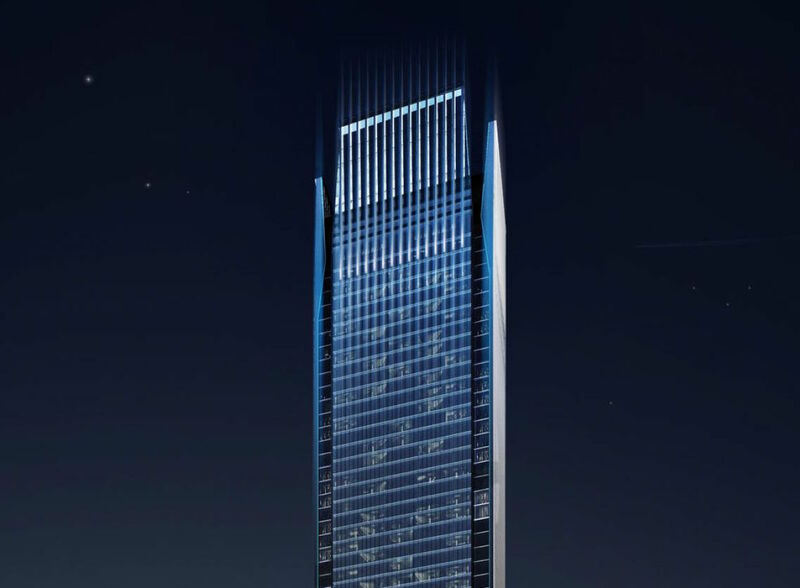 A large tower, with a long exposure oriented toward the south, will contain the hotel component while two shorter, east-west oriented towers will contain the condominium units. The podium will be crisscrossed with interior paseos connecting opposing sides of the development site and is to be wrapped in a 32,000-square foot LED ribbon wall that will create a massive, splashy cornice line backing these proposed retail areas. The project will be located at the center of the ever-growing L.A. Live / Staples Center development area that includes the Los Angeles Convention Center, the partially-completed Metropolis complex, as well as many other in-process or upcoming condominium and apartment projects connected by access to Los Angeles’s Blue and Expo light rail transit lines. Located on a 4.6-acre site between 11th and 12th Streets on Figueroa, Oceanwide Plaza broke ground in late 2015 and its construction has necessitated one of the largest concrete mat pours in Los Angeles history, with crews for the construction firm Lendlease pouring an estimated 25,900 cubic yards of concrete and six million pounds of rebar for the complex’s massive foundations earlier this year. The project is expected to be completed by the end of 2018 and will be open to habitation in early 2019. News of the Park Hyatt hotel development was first reported by the Wall Street Journal. UPDATE: Developers for Oceanwide Plaza have released a slew of updated renderings for the project. 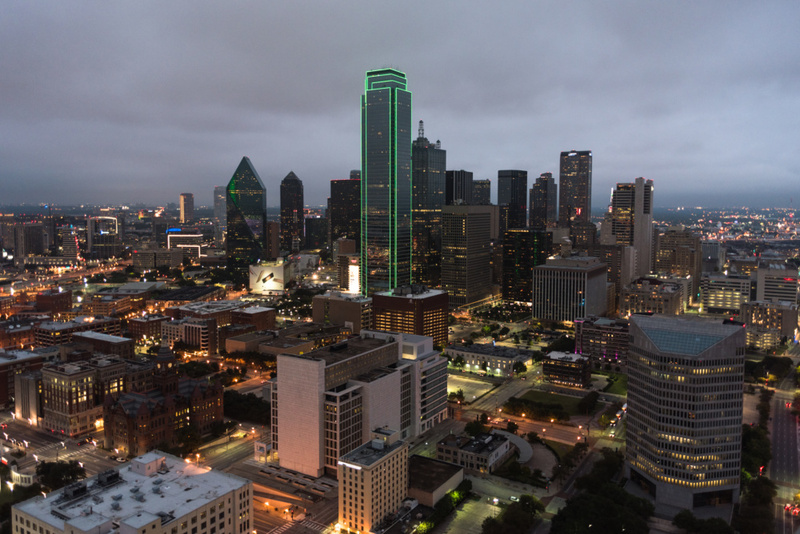 CallisonRTKL Vice President Brendan O'Grady views Dallas' hot climate as an opportunity, rather than a challenge, when it comes to facade design. 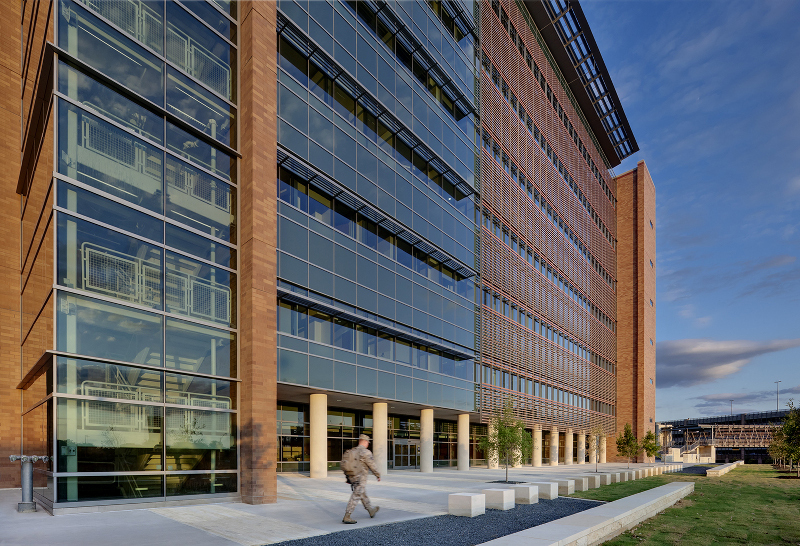 "With the intense summer heat there are numerous opportunities to integrate both passive and active facade design solutions that can reduce the overall environmental impact our buildings have," said O'Grady, who will co-chair October's Facades+ Dallas conference on high performance building design. The city's architects working abroad, moreover, are able to bring lessons learned in other high-heat areas to bear on the local AEC industry. "These firms have the opportunity to take this global perspective and intelligence and apply it to local problems related to facade design and fabrication," he said. Architects, engineers, fabricators, and builders working in the Dallas area excel in digital design and analysis, explained O'Grady. "I would say this is a direct result of the emphasis we are seeing on building performance over pure aesthetics in facade design," he said. On the flip side, "Hearing comments from a recent design awards jury, I would have to say that there is room for improvement in the way a building's program or specific use is reflected in the design of its facade," said O'Grady. "When you look at a building you should be able to tell if it is a hospital versus an office building or an apartment tower." Network with O'Grady and other movers and shakers in the facades world at Facades+ Dallas, October 13-14. Learn more about the first day symposium and the workshops offered on the second day at the conference website. Register today!